The death and subsequent resurrection of Jesus took his disciples on an emotional roller coaster ride. The miracles of his earthly ministry had shocked and amazed even his closest friends, yet his appearances over the forty days following his resurrection seem to have been equally confusing. This resurrected Christ was changed. He was similar, but he was different. Time and again he had to prove to his followers that he was their very same teacher and Lord. Most famously Jesus returned to prove to the “doubting” Thomas that he was the same man who was crucified but was now alive again. Thomas performs the only task he claimed would cure his unbelief by feeling the physical wounds on Jesus’ body. Jesus, again, was the same but different. One thing we certainly know from this account was that he retained the marks of his sacrifice in his body. After that forty days Jesus explained to his disciples that it was time for him to return to the Father. He had returned from the dead, not just in one triumphant gesture, but to spend time with them so that they could cope with this unprecedented event. He prepared them for this transition, this new relational dynamic marked by the gift of the Holy Spirit. And yet, just like during his previous ministry, they heard the words but could not fully comprehend their full meaning. Who exactly was this Comforter Jesus kept saying he was going to send? Jesus’ words would remain with the disciples to encourage them and remind them of what was to come, but the final image at his ascension would also remain etched in their memories. As Jesus was taken up into the sky, to the bewilderment of those around him, they saw his body disappear into the clouds. Evacuation shows the weight of their bewilderment. The fears, the uncertainty, and the awe were written on their faces. It also displays the wounds in Christ’s feet. The last image of Jesus is his broken, yet glorified body. The memory of Christ at his ascension had to be ever present in the minds of these early Christians. Their suffering would not be unlike Christ’s own. Their wounds were matched to his wounds. There was comfort in knowing that Jesus was their advocate before the Father. A comfort that can also be ours. 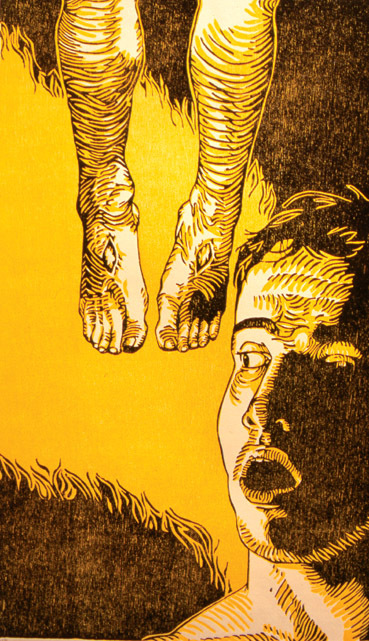 Tyrus Clutter: Evacuation, 2002, two-color woodcut, 35 x 22 cm.